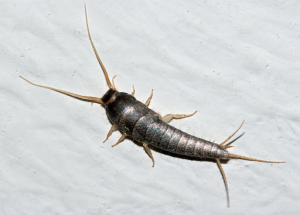 If you are a homeowner that is battling an invasion of silverfish, you will be pleased to know that there are several active pest control measures that you may take in order to eliminate these pesky creatures from your residence. Silverfish are insects that are white or a brownish grey color and are shaped like a teardrop. They may measure up to 19mm in length and contain three very distinctive bristles on their rear section. These insects get their name from their common coloring and the fact that they closely resemble a fish. In this guide, you will learn about these insects and will learn about the active pest control measures that may be taken to eliminate these creatures from your home. Silverfish are uniquely capable of living and thriving in most any type of climate; however, they do tend to gather in areas that are dark and contain a bit of moisture. In the home, these insects are most commonly discovered in the bathroom and kitchen region; however, it is not at all uncommon to observe the creatures in the basement and/or the attic. They may also be found in areas where stored boxes are kept, such as garages and sheds. The main reason that they like storage areas is because they are highly attracted to paper products and to damp clothes. The insects have a unique diet that mostly consists of carbohydrates, such as various types of starches and sugars. Homeowners that have struggled with silverfish have discovered the insects in a wide array of unusual locations. Examples of these areas include food containers and/or boxes that have not been opened, in shampoo, in lotion, in glue, in the linen closet, and in regions where dead insects are located. In order to eliminate silverfish, it is important to know their feeding locations.